Through the summer months he has fattened up and become a large and majestic animal that is absolutely breathtaking. The fall is definitely a huge change from the laziness of the summer months that the bucks experience, since the fall brings about the breeding season and all the frenzy that goes along with it. 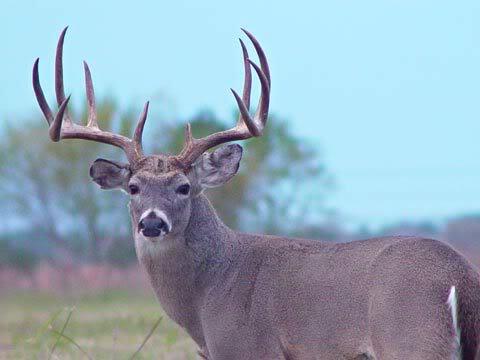 By the time fall rolls around the buck whitetail deer has developed his mature set of antlers, and bucks that are mature begin to become more aggressive during this time. Instead of staying in their local area that they've been staying in for the past two seasons, they will begin to widely roam, looking for does. However, before the actual rut begins, you will see groups of whitetail roaming together, including does, bucks and does, since bucks like to mingle around to proudly show off their antlers. Bucks also work to find plenty of whitetail deer feed before the rutting season begins as well so they can build up plenty of fat and strength that will help get him through the rut, and then on through the winter months that will follow. Since there is less daylight in the fall, this actually triggers the buck to increase the production of testosterone, which leads to antler growth and later to the rut season. 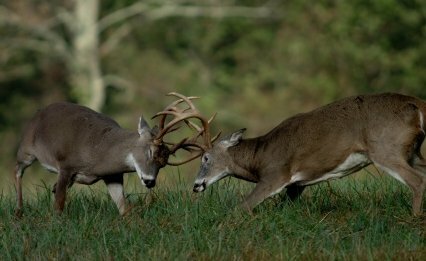 In order to establish what is known a hierarchy in buck dominance, the bucks will begin to spar with each other. They will lock their antlers together and push and wrestle around until one of the bucks back down. However, sparring is different from fighting that can occur between bucks. When one whitetail deer buck has established his dominance, he then keeps his position by staring at other bucks that may want to challenge him. The fall is the time when you will see the whitetail deer buck at his most magnificent. The buck above is putting down a scrape to attract Does. This also lets the other Bucks in the area know he is around. Only when a buck rises to this challenge will two bucks fight, which can end up being quite vicious. Signposting is also used by bucks during the fall months as well. He rubs and scrapes against the trees and ground in order to leave his scent for other bucks and for does to smell. 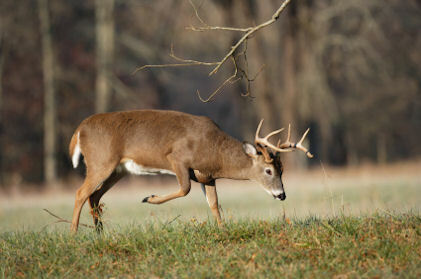 Once the buck finds a doe to hook up with, there is a chase that occurs before they actually mate. This chase can be quite tiring for the buck, although usually the doe will allow him to catch her if she chooses him to mate with. 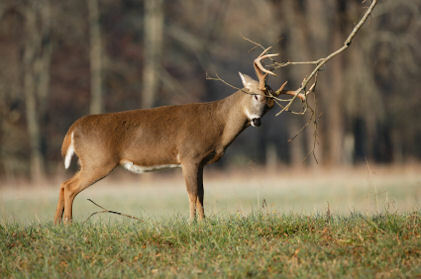 After he mates with the doe, in some cases the buck will stay awhile with the doe and graze, but he usually soon dashes off to find another doe to mate with. Whitetail deer bucks will mate with as many does as possible if they can, and the dominant buck especially, since he usually ends up mating with more does than other bucks, end up being very tired and frail after the rut. In some cases there are some bucks that may be too weak to survive a winter, with the harsh conditions and scarcity of food. During the rut, a buck will use all of the testosterone he has up, which means that in the late fall or early winter, he will lose his beautiful rack. This Buck would be a Typical Whitetail Buck - one that dreams are made of for most hunters.